Updated with some 3.75" figure carded pics. awesome, clone troopers look great. now make them bigger and give me a 6" rex! I'm really liking the new boxes. I don't collect 3.75 inch stuff but those new cards are pretty cool. package is for Chewbacca! So i guess he gets to be a repack for the second time and 3 times released (including the new package one) Why can't they re-release R2-D2 and do a shirtless version of darth maul with all the "tattoos"
im guessing thats the packaging for TFA? it is reminiscent of the imperial or whatever flag in the trailer. I have been loving the 6" Black Series line, but for the life of me, I can't figure out why they have not put out a 6" C-3PO figure? I have all of the figures out thus far but I need a Threepio to complete everything. I have the Revoltech Threepio figure which is slightly larger in scale and can work in certain photos, but it would be nice to have a Hasbro 6" Threepio. 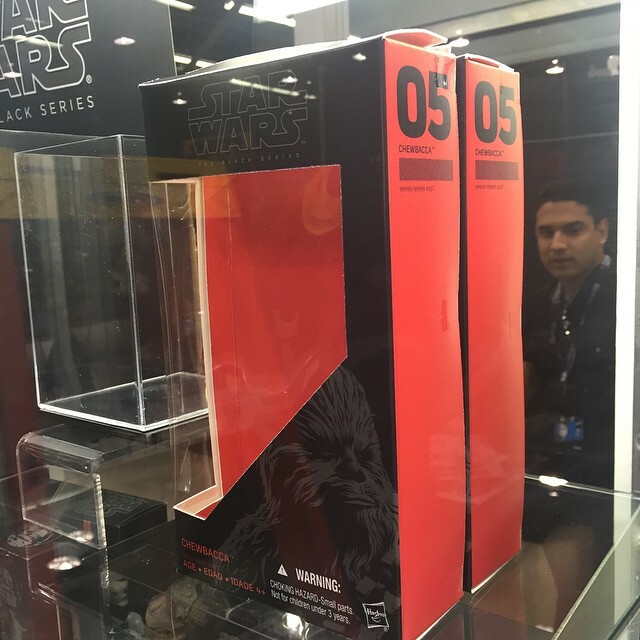 I think the new box for Chewbacca is the new one for Force Awakens, I could be wrong. The only difference for the FA version is the open mouth sculpt. I think the rest of the figure is the exact same.